Go directly here if you are an experienced cook and just want the recipe. Because I am preparing to go on and on about this cake, its geneology, and how to make it. I want children and first time cooks to make it with ease. I even intend to get around to Mother's Day toward the end of this post, honoring the person who moved the mixing bowl to a low stool so I could help make a cake when I was five years old. Still here? First, about the "sheet." It might seem that sheet cake would be baked in a sheet pan (cookie sheet, baking sheet). It rises too much for that. A sheet cake -- at least the homemade version -- is baked flat in a baking pan or casserole dish, so although it is not exactly flat like a sheet, it is flat and rectangular (sheet-like qualities) when compared to a layer cake (stacked up with icing or filling between several round layers) or a pound cake (fat and round with a giant hole in the middle like a doughnut on steroids). This particular sheet cake, taking after its layer cake cousins, has icing, but a luscious poured-on version that avoids all the hassles associated with applying icing competently to layer cakes without first attending several months of expensive training as a pastry chef. Then there's the "western Kentucky" moniker. In truth, this cake and its close cousins are fiercely claimed as "ours" in many parts of the USA, including Texas and the deep South. I met the cake in western Kentucky and developed my tweaks to it while there, so that explains my name for it. This cake fits well with western Kentucky cuisine, which is decidedly more southern than in the rest of Kentucky. As evidence, I offer one word: Barbeque. A small western Kentucky town may have five barbeque restaurants and five more barbeque shacks, all offering memorable morsels. That kind of barbeque abundance is prevalent in western Kentucky and relatively scarce in central, northern, eastern and south-central Kentucky. But never mind. Chocolate sheet cake pleases people in all parts of the state, I'm pretty sure. I have tested it extensively in downtown Lexington, at least. Once I settled here, given that I was still willing to ignore my neighbors' and loved ones' health problems, I made this wonderful cake for most neighborhood meetings or potlucks. It was a novelty here, and so easy to make I became spoiled into thinking I could be at my "real" work until 40 minutes before a neighborhood meeting and still have time to make, bake, and take a (very warm -- yum) cake for refreshments. Total prep time for this cake -- I'll be a grownup and include cleanup time -- might reach 15 minutes. MIGHT. More likely it's a 10 minute process to make the cake, make and pour the icing over the hot cake, and wash the one pan and one bowl you will use. This assumes they will still need washing after you and anyone else you allow into the kitchen lick pot and bowl clean. I believe this is the least fussy, most rewarding chocolate cake one can make. The cake itself is moist and meltingly tender. It does not easily become tough or dry. It requires no creaming, no separating of eggs, not even any wrestling with icing crumbly layers, yet it has a tasty icing that caps the indulgence. I nominate this cake as the first one to teach children to make. Even very little children can carry out nearly every step of the measuring and stirring, as long as an adult manages the hot oven and hot stove. One practical caution: Even though this is a good cake to make in a rush, and a good teaching/engaging cake for children and new cooks, please do not combine these two different missions. For teaching children -- or grownups for that matter -- allow all the time in the world. Going slowly stokes a love of cooking and of the kitchen. Being slow and easy about making this cake means you and your "pupils" can take full advantage of the wonder and fun of kitchen chemistry, while also allowing the ingredients' magical, sensual sides to show off: the smells of the melted butter and chocolate, the glisten of fresh raw eggs, and, of course, the taste of the batters, licked from spoons and fingers. This cake's short cooking time, and its wonderful taste and texture when eaten warm, add to its excellence for working with young (and possibly impatient) cooks. I have modified the original recipe instructions significantly. The ingredients and proportions are nearly the same, with one big exception: I replace the original recipe's margarine with butter, which I have always used for this recipe. 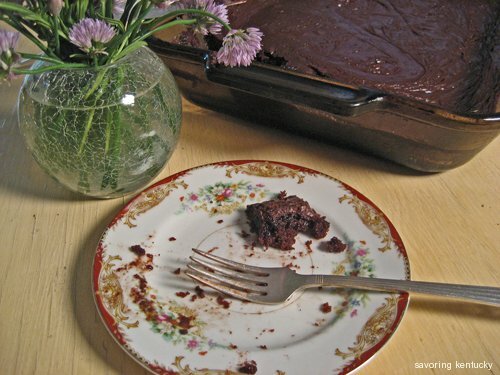 A Mother's Day Add-On: From the beginning, I made the Western Kentucky Chocolate Sheet Cake with butter, not the margarine in the original recipe, or the "shortening" or oils suggested in some variants. Butter brings the flavor - and it is a real food. When I use butter - a lifelong practice - I am following the Ruth Rule. That's Ruth as in my mother, known to her best buddy as "Sweetie Face." Both of the buddies now, our amazing parents, rest in sweet memory. Their food judgments infuse my own each day, all day. As a result, I don't consider margarine a food, and would not subject a mean cat to a dish made with it. Last night I went to the delightful monthly local foods potluck here in Lexington. Five new people showed up just as the meal began. They told about watching Michael Pollan on an Oprah Earth Day program, and about his citing the "grandmother" rule: "Don't eat anything your grandmother wouldn't recognize." I look back only one generation for that guidance, not two. Mother firmly and joyfully trusted in real food, especially OUR real food. In honor of Mother's Day, I offer a column I wrote last year about what Sweetie Face would have cooked for Mother's Day Dinner. I hope your meals for Mother's Day and every day center around real food. Milk into Mozzarella: We like it!